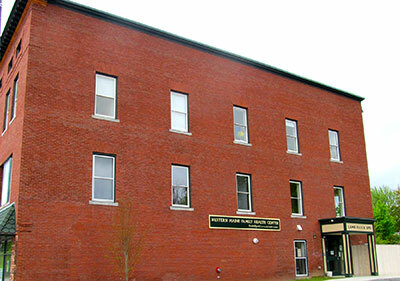 Since 1987 Western Maine Family Health Center has been serving residents of all ages in Livermore Falls and surrounding communities. At our health center our top priority is our patients. We work together with our patients to ensure that all patients receive accessible quality care by providing a "medical home" with a team of professionals using up-to-date knowledge and technology. To learn more about the medical home, click here to learn more and to watch a video: Patient-Centered Medical Home. Our staff includes medical providers, behavioral health consultants, a psychiatric mental health nurse practitioner, as well as clinical and administrative support staff. We offer a variety of services based on the needs of our patients. Our providers also collaborate with Franklin Memorial Hospital in Farmington if needed and refer patients to community partners such as the Breast and Cervical Health Program and Raising Readers. Located in Livermore Falls, Western Maine Family Health Center also serves Canton, Fayette, Hartford, Jay, Livermore, Sumner, Chesterville, Farmington, New Sharon, and Wilton. This area boasts of spectacular year-round scenery and a wealth of natural resources. Situated on the east bank of the Androscoggin River, the town's rich history in the timber industry used the river to drive logs to the mills. Today, the river offers a variety of water activities open to all visitors. In the winter months, groomed snowmobile trails connect to other local municipalities. Our town is also part owner of the nearby Spruce Mountain Ski Slope, a popular ski destination for our residents. in diabetes and heart/stroke care. 10/31/18 10 HealthReach Health Centers Recognized as Let’s Go! Sites of Distinction.